Abstract: The extracellular domain of integrin αvβ3 contains a receptor for thyroid hormone and hormone analogs. The integrin is amply expressed by tumor cells and dividing blood vessel cells. The proangiogenic properties of thyroid hormone and the capacity of the hormone to promote cancer cell proliferation are functions regulated nongenomically by the hormone receptor on αvβ3. An L-thyroxine (T4) analog, tetraiodothyroacetic acid (tetrac), blocks binding of T4 and 3,5,3'-triiodo-L-thyronine (T3) by αvβ3 and inhibits angiogenic activity of thyroid hormone. Covalently bound to a 200 nm nanoparticle that limits its activity to the cell exterior, tetrac reformulated as Nanotetrac has additional effects mediated by αvβ3 beyond the inhibition of binding of T4 and T3 to the integrin. These actions of Nanotetrac include disruption of transcription of cell survival pathway genes, promotion of apoptosis by multiple mechanisms, and interruption of repair of double-strand deoxyribonucleic acid breaks caused by irradiation of cells. Among the genes whose expression is suppressed by Nanotetrac are EGFR, VEGFA, multiple cyclins, catenins, and multiple cytokines. Nanotetrac has been effective as a chemotherapeutic agent in preclinical studies of human cancer xenografts. The low concentrations of αvβ3 on the surface of quiescent nonmalignant cells have minimized toxicity of the agent in animal studies. In 2005, we described a receptor for thyroid hormone on plasma membrane integrin αvβ3 that regulated angiogenesis.9 Of the more than 20 plasma membrane integrins, only αvβ3 binds thyroid hormone and hormone analogs such as tetraiodothyroacetic acid (tetrac).9 The ectodomains of integrins contain a variety of binding sites for extracellular matrix proteins.19 On integrin αvβ3, however, there are also discrete small molecule receptors for resveratrol20 and androgen,21 as well as for thyroid hormone. The intracellular domain of the integrin activates signaling pathways that relate to specific gene transcription22 and interacts with the cytoskeleton.23 The nongenomic regulation of the state of the actin cytoskeleton by L-thyroxine (T4) described by Leonard and Farwell24 and Farwell et al25 may be mediated by αvβ3 (see the Angiogenesis modulation by thyroid hormone and tetrac formulations section). The thyroid hormone–tetrac binding site on the integrin includes contributions from both αv and β3 monomers.29 The site accommodates T4, T3, tetrac, and other hormone analogs such as diiodothyropropionic acid.30 The affinity of the receptor is higher for T4 than for T3,9 and binding of T4 occurs at physiological levels of free T4. The significance of this is that circulating T4 supports tumor cell proliferation in the intact organism. The receptor is subspecialized. One domain that controls cell proliferation binds both T4 and T3 and activates the mitogen-activated protein kinase (ERK1/2) signal transduction pathway.31 This area of the receptor is involved in stimulation of cell proliferation. The second domain binds only T3 and activates the phosphatidylinositol 3-kinase pathway. Downstream consequences of such activity include nuclear uptake of TRα resident in cytoplasm and expression of the hypoxia-inducible factor-1α (HIF-1α) gene.31 Tetrac blocks hormone actions initiated at both domains. The proangiogenic activity of thyroid hormone – and the antiangiogenic properties of tetrac – which begins at αvβ3, appears to involve several mechanisms. For example, the integrin is known to interact physically with the vascular endothelial growth factor (VEGF) receptor family that is adjacent to αvβ3 molecules.32 In the absence of T4 and T3, tetrac and Nanotetrac block activity of VEGF and basic fibroblast growth factor (bFGF) in the chick chorioallantoic membrane angiogenesis assay,33 presumptively by disrupting crosstalk between the integrin and VEGF receptor and bFGF receptor. However, tetrac can also decrease bFGF gene transcription and decrease bFGF protein release by cells.8 Agonist thyroid hormone enhances platelet-derived growth factor activity (Mousa, unpublished observations), and this effect is subject to tetrac inhibition. Epidermal growth factor (EGF) is also proangiogenic, and Nanotetrac, acting via αvβ3, downregulates transcription of the EGFR gene.12 Thus, a number of molecular mechanisms are involved in actions of thyroid hormone analogs at their receptor on the integrin. 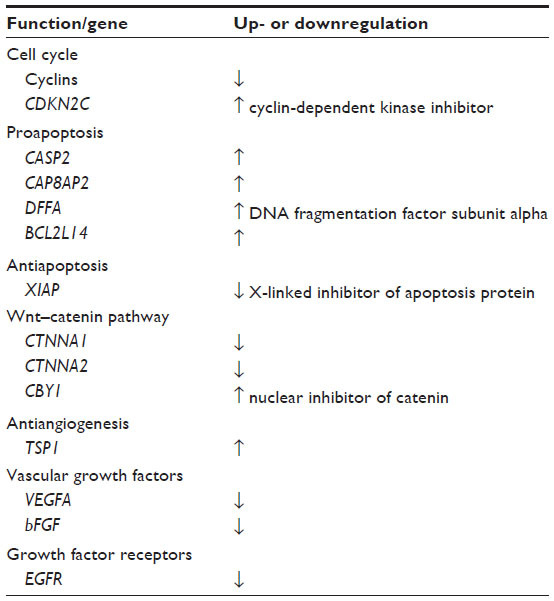 Other tumor cell genes affected by Nanotetrac via αvβ3 are discussed here. Small arteriole muscularization is promoted by thyroid hormone,36 but it is not yet known whether this effect is αvβ3-dependent. Tetrac decreases abundance of angiopoietin-2 (Ang-2) messenger ribonucleic acid (mRNA) in endothelial cells33 but does not affect Ang-1. Ang-2 protein destabilizes blood vessel structure in anticipation of vascular growth factor action and promotion of angiogenesis, whereas Ang-1 stabilizes such structure and functionally is antiangiogenic. The distribution of the integrin among various types of cells is relevant to therapeutic exploitation of the small molecule receptors on αvβ3, such as those for thyroid hormone. Rapidly dividing cells, notably cancer cells and endothelial cells about tumors, express the integrin generously. Nonmalignant, quiescent cells do not. When we examined immortalized noncancer human and nonhuman primate cells for susceptibility to antiproliferative action of Nanotetrac, we found no drug activity (Mousa, unpublished observations). The complex actions of Nanotetrac on angiogenesis have been mentioned previously, and EGFR was included in this context. EGF is mitogenic and its receptor mediates other tumor cell support functions beyond angiogenesis. These have made the receptor, EGFR, and its ligand, EGF, chemotherapeutic targets,40 and cetuximab is the prototypical clinical EGFR antibody. The action of Nanotetrac to suppress transcription of the EGF receptor gene conceptually has advantages over EGFR antibody because Nanotetrac is targeted to cancer cells that express αvβ3 and thus does not affect this cell surface target in healthy (nonmalignant) cells. In addition, Nanotetrac has a spectrum of other anticancer actions noted previously. Finally, agonist thyroid hormone induces internalization of αvβ3.45 This was initially interpreted by us to reflect the known recycling of the integrin46 but is now recognized to be relevant to gene expression. Tetrac blocked internalization of αvβ3, and we subsequently found that T4 directed the αv monomer, but not β3, into the cell nucleus. In the nucleus, αv was found to function as a coactivator, supporting transcription of several genes that are important to cancer cell biology, including HIF-1α and the estrogen receptor (ERα).45 Thus, the thyroid hormone–tetrac receptor on αvβ3 has a variety of functions mediated by the intact heterodimer, but the interaction of hormone and αvβ3 is capable of changing the structure and function of the integrin. In the course of describing certain novel cellular actions of T4 and T3, we determined that these actions could be reproduced by agarose-T4, a nanoparticulate formulation of the hormone that cannot enter the cell.8,50,51 Thus, the actions were necessarily initiated at the plasma membrane and were nongenomic in mechanism. We also found that tetrac, the naturally occurring deaminated metabolic product of T4, inhibited these membrane-initiated actions of iodothyronines and agarose-T4.50,51 We described the plasma membrane receptor for thyroid hormone on integrin αvβ3 a decade ago9 and distinguished the downstream consequences and mechanisms of nongenomic actions initiated at the integrin from genomic actions.12,27 We confirmed the activity of tetrac as an inhibitor of nongenomic actions of T4 and T3 at the hormone receptor on αvβ3.9,12 Reformulation of tetrac as Nanotetrac38,52 resulted in an agent that is limited to the extracellular space and that is a more potent inhibitor of agonist thyroid hormone actions.12 In addition, as pointed out, Nanotetrac modulates expression of a broader spectrum of cancer cell survival pathway genes. The poly(lactic-co-glycolic acid) nanoparticle to which tetrac is covalently bound in Nanotetrac is capable of adsorbing traditional nonprotein cancer chemotherapeutic agents. The targeting by tetrac of the nanoparticulate to cancer cells permits local delivery of such second agents, an approach that is more desirable than systemic administration of the drugs. The support of M Frank Rudy, Margaret D Rudy, and Richard Liebich was essential to a number of the experiments reviewed in this paper. Authors PJ Davis and SA Mousa hold US patents on nanoparticulate tetrac (Nanotetrac). The authors report no other conflicts of interest in this work. Goodman AD, Hoekstra SJ, Mars PS. Effects of hypothyroidism on the induction and growth of mammary cancer induced by 7,12-dimethylbenz(a)anthracene in the rat. Cancer Res. 1980;40(7):2336–2342. Borek C, Guernsey DL, Ong A, Edelman IS. Critical role played by thyroid hormone in induction of neoplastic transformation by chemical carcinogens in tissue culture. Proc Natl Acad Sci U S A. 1983;80(18):5749–5752. Hall LC, Salazar EP, Kane SR, Liu N. Effects of thyroid hormones on human breast cancer cell proliferation. J Steroid Biochem Mol Biol. 2008;109(1–2):57–66. Cohen K, Ellis M, Khoury S, Davis PJ, Hercbergs A, Ashur-Fabian O. Thyroid hormone is a MAPK-dependent growth factors for human myeloma cells acting via αvβ3 integrin. Mol Cancer Res. 2011;9(10):1385–1394. Meng R, Tang HY, Westfall J, et al. Crosstalk between integrin αvβ3 and estrogen receptor-α is involved in thyroid hormone-induced proliferation in human lung cancer cells. PLoS One. 2011; 6(11):e27547. Lin HY, Tang HY, Shih A, et al. Thyroid hormone is a MAPK-dependent growth factor for thyroid cancer cells and is anti-apoptotic. Steroids. 2007;72(2):180–187. Davis FB, Lin HY, Shih A, et al. Acting via a cell surface receptor, thyroid hormone is a growth factor for glioma cells. Cancer Res. 2006;66(14):7270–7275. Davis FB, Mousa SA, O’Connor L, et al. Proangiogenic action of thyroid hormone is fibroblast growth factor-dependent and is initiated at the cell surface. Circ Res. 2004;94(11):1500–1506. Bergh JJ, Lin HY, Lansing L, et al. Integrin alphavbeta3 contains a cell surface receptor for thyroid hormone that is linked to activation of mitogen-activated protein kinase and induction of angiogenesis. Endocrinology. 2005;146(7):2864–2871. Liu X, Zheng N, Shi YN, Yuan J, Li L. Thyroid hormone induced angiogenesis through integrin αvβ3/protein kinase D/histone acetylase 5 signaling pathway. J Mol Endocrinol. 2014;52(3):245–254. Chen J, Ortmeier SB, Savinova OV, et al. Thyroid hormone induces sprouting angiogenesis in adult heart of hypothyroid mice through the PDGF-Akt pathway. J Cell Mol Med. 2012;16(11):2726–2735. Davis PJ, Davis FB, Mousa SA, Luidens MK, Lin HY. Membrane receptor for thyroid hormone: physiologic and pharmacologic implications. Annu Rev Pharmacol Toxicol. 2011;51:99–115. Luidens MK, Mousa SA, Davis FB, Lin HY, Davis PJ. Thyroid hormone and angiogenesis. Vascul Pharmacol. 2010;52(304):142–145. Hercbergs AA, Goyal LK, Suh JH, et al. Propylthiouracil-induced chemical hypothyroidism with high-dose tamoxifen prolongs survival in recurrent high grade glioma: a Phase I/II trial. Anticancer Res. 2003;23(1B):617–626. Cristofanilli M, Yamamura Y, Kau SW, et al. Thyroid hormone and breast carcinoma. Primary hypothyroidism is associated with a reduced incidence of primary breast carcinoma. Cancer. 2005;103(6):1122–1128. Schmidinger M, Vogl UM, Bojic M, et al. Hypothyroidism in patients with renal cell carcinoma: blessing or curse? Cancer. 2011;117(3):534–544. Nelson M, Hercbergs A, Rybicki L, Strome M. Association between development of hypothyroidism and improved survival in patients with head and neck cancer. Arch Otolaryngol Head Neck Surg. 2006;132(10):1041–1046. Hercbergs AH, Ashur-Fabian O, Garfield D. Thyroid hormones and cancer: clinical studies of hypothyroidism in oncology. Current Opin Endocrinol Diabetes Obes. 2011;17(5):432–436. Plow EF, Haas TA, Zhang L, Loftus J, Smith JW. Ligand binding to integrins. J Biol Chem. 2000;275(29):21785–21788. Lin HY, Lansing L, Merillon JM, et al. Integrin alphavbeta3 contains a receptor site for resveratrol. FASEB J. 2006;20(10):1742–1744. Lin HY, Sun M, Lin C, et al. Androgen-induced human breast cancer cell proliferation is mediated by discrete mechanisms in estrogen receptor-alpha-positive and -negative breast cancer cells. J Steroid Biochem Mol Biol. 2009;113(3–5):182–188. Zhou X, Murphy FR, Gehdu N, Zhang J, Iredale JP, Benyon RC. Engagement of alphavbeta3 integrin regulates proliferation and apoptosis of hepatic stellate cells. J Biol Chem. 2004;279(23):23996–24006. Stefansson S, Su EJ, Ishigami S, et al. The contributions of integrin affinity and integrin-cytoskeletal engagement in endothelial and smooth muscle cell adhesion to vitronectin. J Biol Chem. 2007;282(21):15679–15689. Leonard JL, Farwell AP. Thyroid hormone-regulated actin polymerization in brain. Thyroid. 1997;7(1):147–151. Farwell AP, Dubord-Tomasetti SA, Pietrzykowski AZ, Stachelek SJ, Leonard JL. Regulation of cerebellar neuronal migration and neurite outgrowth by thyroxine and 3,3′,5′-triiodothyronine. Brain Res Dev Brain Res. 2005;154(1):121–135. Cohen K, Ellis M, Shindeman E, Khoury S, Davis PJ, Hercbergs A, Ashur-Fabian O. Relevance of thyroid hormones-alphavbeta3 pathway in primary myeloma to bortezomib action. Leuk Lymphoma. 2014;20:1–8. Cheng SY, Leonard JL, Davis PJ. Molecular aspects of thyroid hormone actions. Endocr Rev. 2010;31(2):139–170. Moreno M, De Lange P, Lombardi A, Silvestri E, Lanni A, Goglia F. Metabolic effects of thyroid hormone derivatives. Thyroid. 2008;18(2):239–253. Lin HY, Cody V, Davis FB, et al. Identification and functions of the plasma membrane receptor for thyroid hormone analogues. Discov Med. 2011;11(59):337–347. Mousa SA, O’Connor L, Davis FB, Davis PJ. Proangiogenesis action of the thyroid hormone analog 3,5-diiodothyropropionic acid (DITPA) is initiated at the cell surface and is integrin-mediated. Endocrinology. 2006;147(4):1602–1607. Lin HY, Sun M, Tang HY, et al. L-thyroxine vs 3,5,3′-triiodo-L-thyronine and cell proliferation: activation of mitogen-activated protein kinase and phosphatidylinositol 3-kinase. Am J Physiol Cell Physiol. 2009;296(5):C980–C991. Mahabeleshwar GH, Feng W, Reddy K, Plow EF, Byzova TV. Mechanisms of integrin-vascular endothelial growth factor receptor cross-activation in angiogenesis. Circ Res. 2007;101(6):570–580. Mousa SA, Bergh JJ, Dier E, et al. Tetraiodothyroacetic acid, a small molecule integrin ligand, blocks angiogenesis induced by vascular endothelial growth factor and basic fibroblast growth factor. Angiogenesis. 2008;11(2):183–190. Mousa SA, Lin HY, Tang HY, Hercbergs A, Luidens MK, Davis PJ. Modulation of angiogenesis by thyroid hormone and hormone analogues: implications for cancer management. Angiogenesis. 2014;17(3):463–469. Yu CH, Law JB, Suryana M, Low HY, Sheetz MP. Early integrin binding to Arg-Gly-Asp peptide activates actin polymerization and contractile movement that stimulates outward translocation. Proc Natl Acad Sci U S A. 2011;108(51):20585–20590. Savinova OV, Liu Y, Aasen GA, et al. Thyroid hormone promotes remodeling of coronary resistance vessels. PLoS One. 2011;6(9):e25054. Glinskii AB, Glinsky GV, Lin HY, et al. Modification of survival pathway gene expression in human breast cancer cells by tetraiodothyroacetic acid (tetrac). Cell Cycle. 2009;8(21):3562–3570. Yalcin M, Dyskin E, Lansing L, et al. Tetraiodothyroacetic acid (tetrac) and nanoparticulate tetrac arrest growth of medullary carcinoma of the thyroid. J Clin Endocrinol Metab. 2010;95(4):1972–1980. Yalcin M, Lin HY, Sudha T, et al. Response of human pancreatic cancer cell xenografts to tetraiodothyroacetic acid nanoparticles. Horm Cancer. 2013;4(3):176–185. Mendelsohn J, Baselga J. Epidermal growth factor receptor targeting in cancer. Semin Oncol. 2006;33(4):369–385. Sarfati M, Fortin G, Raymond M, Susin S. CD47 in the immune response: role of thrombospondin and SIRP-alpha reverse signaling. Curr Drug Targets. 2008;9(10):842–850. Rae MT, Gubbay O, Kostogiannou, Price D, Critchley HO, Hillier SG. Thyroid hormone signaling in human ovarian surface epithelial cells. J Clin Endocrinol Metab. 2007;92(1):322–327. Hadler-Olsen E, Winberg JO, Uhlin-Hansen L. Matrix metalloproteinases in cancer: their value as diagnostic and prognostic markers and therapeutic targets. Tumour Biol. 2013;34(4):2041–2051. Lin HY, Su YF, Hsieh MT, et al. Nuclear monomeric integrin αv in cancer cells is a coactivator regulated by thyroid hormone. FASEB J. 2013;27(8):3209–3216. Roberts MS, Woods AJ, Dale TC, Van Der Sluijs P, Norman JC. Protein kinase B/Akt acts via glycogen synthase kinase 3 to regulate recycling of alpha v beta 3 and alpha 5 beta 1 integrins. Mol Cell Biol. 2004;24(4):1505–1515. Hercbergs A, Davis PJ, Davis FB, Ciesielski MJ, Leith JT. Radiosensitization of GL261 glioma cells by tetraiodothyroacetic acid (tetrac). Cell Cycle. 2009;8(16):2586–2591. Hercbergs AH, Lin HY, Davis FB, Davis PJ, Leith JT. Radiosensitization and production of DNA double-strand breaks in U87MG brain tumor cells induced by tetraiodothyroacetic acid (tetrac). Cell Cycle. 2011;10(2):352–357. Mousa SA, Thangirala S, Yalcin M, et al. Actions of nanoparticulate tetraiodothyroacetic acid (Nanotetrac) on human prostate carcinoma xenograft growth, vascularity and integrin response to radiation. Annual Meeting of the American Association for Cancer Research; April 9, 2014; San Diego, CA, USA. Abstract 5378. Shih A, Lin HY, Davis FB, Davis PJ. Thyroid hormone promotes serine phosphorylation of p53 by mitogen-activated protein kinase. Biochemistry. 2001;40(9):2870–2878. Shih A, Zhang S, Cao HJ, et al. Disparate effects of thyroid hormone on actions of epidermal growth factor and transforming growth factor-α are mediated by 3′,5′-cyclic adenosine 5’-monophosphate-dependent protein kinase II. Endocrinology. 2004;145(4):1708–1717. Bharali DJ, Yalcin M, Davis PJ, Mousa SA. Tetraiodothyroacetic acid-conjugated PLGA nanoparticles: a nanomedicine approach to treat drug-resistant breast cancer. Nanomedicine (Lond). 2013;8(12):1943–1954.